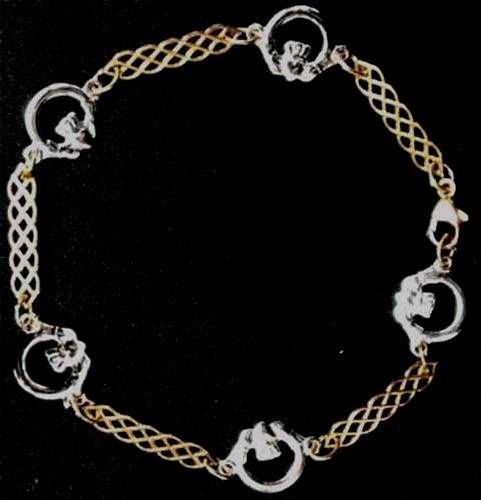 This gold Claddagh bracelet is a two tone design with Celtic knot connecting links. This Claddagh bracelet has been hallmarked 10K gold by the Irish Assay Office at Dublin Castle in Ireland. This Claddagh bracelet is crafted in 10K gold and it features five white Claddagh links along with five Celtic knot connecting links that are crafted in 10K yellow gold. The 7 1/2" long Irish bracelet with a lobster claw catch is made in Dublin, Ireland by TJH and it is gift boxed with the Galway Folklore along with a Claddagh history card that is complements of The Irish Gift House.